The wheel size debate seems to be never-ending. Whether it takes the form of a humorous, ironic banter or a serious, bitter argument – it is not easily decided. 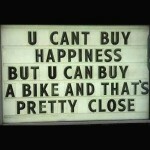 And no matter how many bikes you have in your garage, when you are about to buy a new one, you have to make a choice. For some, it is easy: The riders who always buy what’s new will jump on the new standard. While others stick to what they have been riding for years and never even consider trying a different setup. But everybody else is reading through reviews, asking buddies and (hopefully) test riding. Sometimes it all gets confusing, when all you want to do is ride your bike. So here’s a shortcut. In just 7 questions, find out what’s your wheel size. Don’t take it too seriously, though – test riding is the best way to come to your own conclusion, of course. Tim likes bikes. So much that he's spending a lot of his free time riding them. He also likes thinking about new bikes, parts and gear. That's how he ended up writing about them.